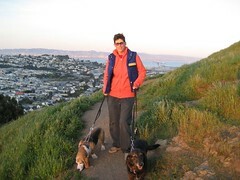 Me and the dogs on Bernal Hill. Yesterday I worked from home — a really lovely thing to do now and again — and K. came home in time for us to take the dogs on a long walk up Bernal Hill before sunset. On the way there a couple pulled their car over to get out and pet the dogs; they’d lost their basset hound in November and were really taken with old Haylee. 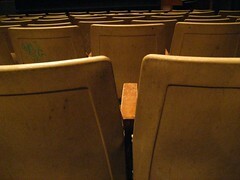 It was sweet, although a little melancholy. I’m glad Haylee is aging so gracefully, and is able to hike up big hills like this one. In other news, I got a note from J. saying she and B. had just been talking about how they could never live in San Francisco again because of, among other things, “crazy people urinating on your front porch.” So it was funny that the evening before I’d taken this picture. I feel like we’re in a neighborhood where there’s we’ll be less likely to fall prey to this unfortunate problem, but I suppose only time will tell. Finally, I’m happy that I’ve moved closer to Vegas, so that if Michael Jackson really does build a 50-foot robot replica of himself that wanders the desert and shoots laser beams, I can just rent a car and drive out and see it. I heard yesterday on The Osgood Files that San Francisco has the highest gas prices in the U.S., averaging about $3.19 a gallon. We don’t have a car here, so that’s not effecting us so much, but we do plan on renting one soon for a road trip. It seems like Methodists are getting more like Catholics as the years go by. Anyhow, Lent has become a big thing and we were encouraged to give up something for Lent. – decrease our dependence on middle-east oil. So I’m giving up mph for Lent and I intend to keep on keepin’ on after Lent is over with. This means I’m driving the speed limit in town and 5 mph under the speed limit on the highway. No big deal, but if everybody in the USA did it … Who knows what the result would be? I know it would have to be good. SO, take your foot off the gas, and kick them terrorists where it hurts. This weekend we did a bunch of stuff that we had been saying we’d do, including taking our first City Guide walking tour. It’s this non-profit group that gives free (okay, they ask for a donation) tours all over the city — there are dozens of tours. We took the Palace Hotel tour; the hotel was built in the late 1800s, and was rebuilt in 1909 after the earthquake. This picture is from the bar there, called Maxfield’s. 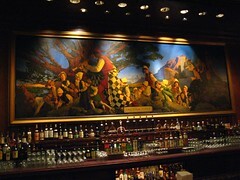 It’s named after Maxfield Parrish, who, of course, painted this enormous painting over the bar, which is now worth millions of dollars. I’m a Parrish fan, so that was pretty neat to see. The tour was great (especially for the price); you can see some pics of the place here. Afterwards we went up to Union Square and ate Swedish pancakes at Sears Fine Foods. We also ventured into Oakland this weekend for the first time and met E. and B. for some tasty Mexican food at Doña Tomás. On Sunday we nearly killed ourselves assembling our new Ikea couch (“No assemby required!” we were told by two poorly-informed Ikea furnishing employees when we purchased it) but we rewarded ourselves with a nice diner lunch at Welcome Home in the Castro and had a nice stroll through the neighborhoods back home, which redeemed the day. I saw this on my walk home tonight. Obviously, boredom has struck somebody pretty hard. But I wasn’t bored at all. When S. was in town a bit ago she told me that the iPod was made for San Francisco. I hadn’t really been listening to my iPod much walking around town, and when I had, I’d been listening to edifying audiobooks and podcasts. But I’ve switched gears back to my music collection and now I don’t want to stop. It started yesterday morning, when I suddenly and strangely got the urge to hear the Cambridge Singers perform John Rutter’s “For the Beauty of the Earth.” On the way home I listened to “Burn Your Piano” by The Barkers, a CD you can’t really find anymore. This morning “River of Stars,” Andrea Perry’s latest release, walked me to work, and tonight I nursed a mild case of homesickness Dolly Parton’s “Tennessee Homesick Blues.” It energized me so much I skipped the bus and walked all the way home. Last night we went to see “Little Children” at the Roxie, getting out of the house on a Monday night! It was a well-done movie. I meant to see this before the Oscars, but we’re suffering a little bit of sticker shock from the movie prices here. We’ve ordered some discount tickets from our Entertainment Passbook, but we haven’t received them yet. Not sure the Passbooks here are going to be as great as they are in Austin, but we’ll get some use out of it. Anyhow, the Roxie is low-key and independent, and I feel good about going there, no matter what the price. We made a to-do list of things we needed to get done to really feel finished with moving in, and we got a lot of them done today. K. really did more than me, but I managed to do a few things too. Yesterday we ordered a new sofa/bed, so we’ll have even more room for guests. 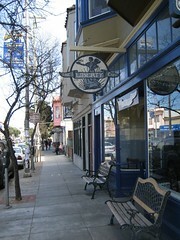 We took a break for a late brunch and headed to the Liberty Cafe on Cortland. A woman at the table next to us was wearing a Whip-In t-shirt; it turns out she was one-half of a couple who live in Austin, in Travis Heights, who are considering a move to San Francisco, preferably to Bernal. They’re on the five-year plan for their move, however, so it may be awhile before we’re bumping into them regularly. 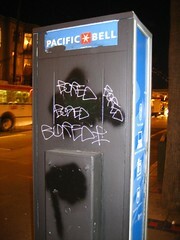 It’s one of the many things San Francisco is famous for. 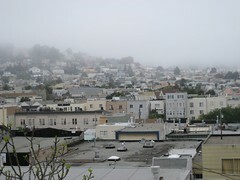 Our neighborhood is pretty sunny, but this morning our view of hills was completely obscured by the fog. It’s really kind of awesome, too.